April showers bring new paperback releases, and we’re particularly excited about this bunch. This star-studded list features many of our favorite authors from the Agatha Christie of our time, Ruth Ware, to the legend behind the heart-pounding Cork O’Connor mysteries, William Kent Krueger, to an award-winning writer of the beloved novel THE ENGLISH PATIENT, Michael Ondaatje, and a few more you cannot afford to miss. This month’s Book Club Favorite’s pick is by the author of LUCKIEST GIRL ALIVE, Jessica Knoll. Her timely second novel follows sisters who join the cast of a reality TV series along with three other hyper-successful women. 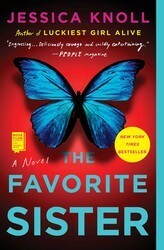 But no one ever expected the season to end in murder…A blisteringly paced thriller, THE FAVORITE SISTER explores the invisible barriers that prevent women from rising in the ranks in today’s America and offers a scathing take on the relentless pressure to stay young, relevant, and salable. Still, when the truth comes out in the explosive final weekend of filming, neither of them ever expected that the season would end in murder. On former President Barack Obama’s 2018 summer reading list, WARLIGHT is a meditation on the lingering effects of Word War II on a family. After the war, when their parents move to Singapore, 14-year-old Nathaniel and his older sister, Rachel, are left behind in London in the care of a mysterious figure known as The Moth and his eccentric crew of friends. After months of silence, the siblings’ mother returns without their father or much of an explanation of his whereabouts. Years later, Nathaniel finally begins to piece together the mysteries of that time. While waiting for Ware’s new novel, THE TURN OF THE KEY, to hit the shelves late this summer, we’ll gladly dive into this white-knuckling thriller. Hal receives a mysterious letter bequeathing her a substantial inheritance, but is she the intended recipient? Full of spellbinding menace and told in Ruth Ware’s signature suspenseful style, this is an unforgettable thriller from the Agatha Christie of our time. Fans of A MAN CALLED OVE and A LITTLE LIFE have to read this stunning novel from internationally bestselling author Sarah Winman. TIN MAN is the intimate, heartbreaking story of a working-class man and all the loves and small kindnesses that make a life. One photo snapped in a drunken moment at a party changes the lives of Nina, one of Nashville’s elite, and Tom, a single dad struggling to make ends meet. At the heart of this scandal, Nina; Tom; and his daughter, Lyla, try to make sense of it all—questioning their closest relationships, asking themselves who they really are, and searching for the courage to live a life of true meaning. If you’re not familiar with William Kent Krueger’s Cork O’Connor mysteries, his latest installment might be what reels you into this award-winning series. In DESOLATION MOUNTAIN, Krueger takes readers back to the Tamarack County, the atmospheric Minnesotan setting of his earlier works. Cork O’Connor and his son, Stephen, work together to uncover the truth behind the tragic plane crash of a senator on Desolation Mountain and the mysterious disappearances of first responders, the scope and consequences of which go far beyond what father or son could ever have imagined.